Man are there a lot of options to get to Petco. 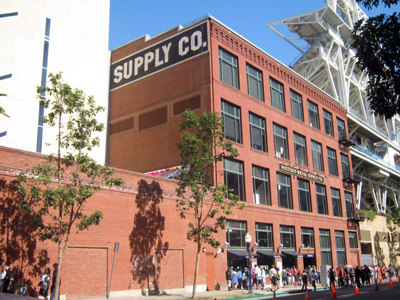 Driving can be tricky with the crowded freeway, but you can't complain about the parking options in the Gaslamp Quarter as they are plentiful and pretty reasonable (+1), especially considering California prices. The trolley (+1), bus (+1), and train (+1) are equally reasonable options and PETCO even has ferry and water taxis available as non-traditional options (+1). What more could you ask for? 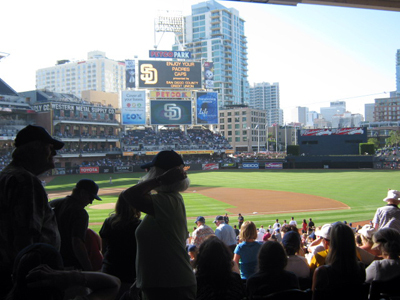 The Padres don't yet have "marquee" game pricing (+1) although they do charge a little more on weekends. Compared to the other West Coast teams, their prices are incredibly reasonable (+1). Tickets for the Park at the Park can be had for only $5 (+1) and with how empty the stadium can be it would be fairly easy to trade up. The seats themselves are all pretty good (+1), although foul balls can be tough to spot deep in the lower level. The upper level is surprisingly close to the action (+1) and doesn't have the effect that causes you to misjudge the trajectory of a ball like Miller Park. Overall, there are few bad seats at PETCO. 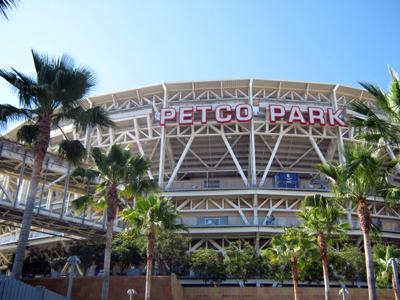 Petco does not look like any other ballpark from the outside. Normally, I would say this is a bad thing, but Petco's architecture perfectly matches San Diego and Southern California (+1). The yellow brick matches the look of many of San Diego's historic buildings (+1) and the white metalwork seems to fit the ocean location of the city (+1). There is a lot of greenery on the outside (+1) and a pretty decent view of the park can be seen from the downtown gate by the Park at the Park (+1). The Western Metal Supply and Showley Candy buildings also jut out of the stadium to provide an even more interesting contrast (+1). There is not a spot outside the stadium that doesn't possess an interesting feature. Although the park doesn't feel as intimate as parks like PNC or Wrigley, it still provides a pretty cool experience once you enter the gates (+1). 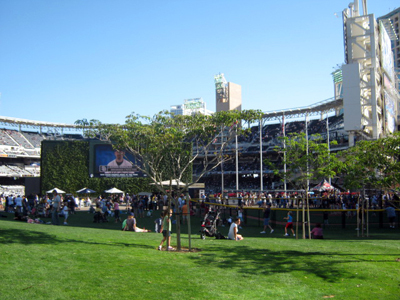 The Park at the Park has to be the coolest feature as it is an entire park inside Petco (+1) complete with a Little League ball field (+1). You can even see the game action on a video board on the back of the batter's eye. The interior architecture matches the outside and features a lot of plant life along with the yellow brick and white metal (+1). The upper deck is even broken up by two towers filled with luxury boxes. I have never seen an upper deck that looks that interesting (+1). You can see decent view of downtown and the bay, but they aren't the best views in the majors. The only problem is the fact that you cannot traverse the entire concourse and still see the game (-1). The first-base side is almost entirely below field level, which is a shame for an otherwise great ballpark. The scoreboard appears to be where they saved money building Petco. The video board is pretty small compared to newer stadiums like Nationals Park and Yankee Stadium, but it gets the job done. The out-of-town scoreboard in the outfield displays all the scores, all the time, which is exactly how it should be (+1). The scoreboard itself, though, is pretty awful. It is functional in that it shows the players and important stats, but it harkens back to the yellow LED era, which is not something we should return to (-1). There is also nothing about the scoreboard that says "classic baseball," which is something for which I always remove points (-1). The Park at the Park is a great place for kids. There are picnic areas (+1), a playground (+1), and a mini baseball field (+1). You can purchase pretty cheap tickets for the Park at the Park (+1) and you can even see most of the game from there (+1). With so many other things to do in the park I can't fault fans too much for not seeming to care, but there was more discussion by the fans around us about lemon ice than baseball (-1). Add to that the fact that the stadium was only 2/3rds full for a first place team on a Saturday just after the All-Star Break and many of the people who did decide to show up showed up late and you have some pretty laid-back fans (-1). I know it's San Diego, but it was pretty bad. At least they showed some enthusiasm during the stretch (+1). The ushers are incredibly nice (+1), although there is some ticket-checking for the box seats. Trading up within your own section is pretty easy, though (+1). However, there are way too many areas of the stadium that are closed off to the average fan (-1). I didn't even know some of them existed until I researched a bit online. Most of the restaurants can't be accessed by anyone not holding a really expensive ticket and there is an area behind the Padres' bullpen that can only be seen from the party suite. There seem to be a lot more closed off areas at Petco than most stadiums. They sing "Take Me Out" (+1), it is played on an organ (that may or may not be real (+1)), and the fans seemed to get into it more than they did the game (+1). They play "You've Lost That Lovin' Feeling" by the Righteous Brothers in the eighth inning, but even though the Righteous Brothers were from Southern California (+1) they are more closely associated with L.A. than San Diego so it seems an odd choice (-1). 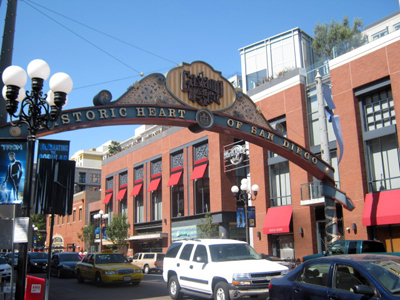 The Gaslamp Quarter provides pretty much anything you would want to do after a ball game (+1). It's a revitalized area of San Diego and, even though construction is still continuing, it is a pretty exciting place at night (+2). It definitely rivals Wrigley and Rogers Centre as great places to hang out after a game (+2).